Gates can be damaged over time since they are constantly exposed to adverse weather conditions and the possibility of accidents. This often results in the onset of rot on wooden gates, or rust on steel ones. Where electric gates are concerned, galvanic corrosion might even add to its decay. If your gate has taken on an unsightly shape over the years, and is now doing little to keep you protected, contact one of our consultants to find out more about our rusted and rotten gate repair services. Many of the components associated with electric gates will be damaged over time, either from weathering, accidents, wear-and-tear or even galvanic corrosion. When they fail, your gate will be less accessible, and even less secure. So, if you need to have your motor or its associated parts replaced or repaired, contact us to have your electric gate repaired. Our team can also assist you with replacing, restoring or repairing crucial gate components. Your wheels may need replacing while your gate chain may need to be restored. In some instances, even your hinge welding needs repairs. Whatever it is you need to get your gate working like new once more, our technicians are able to provide it. 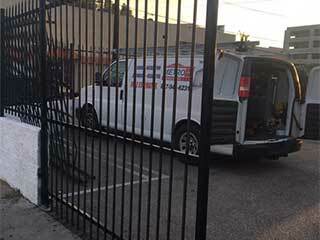 If you would like to know more about how we can assist you with repairing your gate, contact one of our representatives at Garage Door Repair Chula Vista today and speak to us for advice, information or assistance. We are waiting for your call.